Review | Once, the world of cars was clearly divided. The Germans made reliable cars, the Swedish produced safe cars, the Italians went for beauty and the French created comfortable vehicles. Now things are completely different. For example, Citroën introduces the DS5; a car that combines beauty with brains and a high fun factor with low emissions. Offering more of the same isn't a recipe for success. Of course Citroën could have copied the classical, reliable and robust German car. But then it wouldn't have been a true Citroën. This is why the French carmaker approached things differently. It didn't use the C5 as a base for its new luxury model. Instead it took the highly successful DS4 and gave it a longer wheelbase and a wider track. The bodywork is neither a sedan nor a hatchback, but resembles a "shooting break" (an aerodynamic estate) if anything. The body isn't just sleek, but especially well built. For example, look at the line (in a colour of your choice!) that runs from the headlight all the way to the wing mirror. The rims with little "blades" are works of art in their own right. Even the cabin differs from other "premium" models by other brands. Of course the best materials available have been used and the build quality is immaculate. Yet those are the only similarities with other upmarket cars. To start with, the seating position is raised just a bit, giving the driver a better view over traffic. Regrettably this also means headroom in the front leaves something to be desired. During the test drive the button for the height adjustment of the seat was pressed again and again hoping it would lower just a bit more, but in vain. There's no lower back support either, which can be unpleasant on longer journeys. The legroom in the rear is also below average. The dashboard is sculpted around the driver and front passenger to give the illusion of a cockpit. To emphasise on that, many toggle switches can be found on the centre console and even on the ceiling. Despite this unusual set-up, all functions are easy to use and the driver feels right at home. Only the unusually large steering wheel remains awkward. Another hint to the world of aviation is the "head-up" display, which projects the speed of the car right in the view of the pilot to make driving less demanding. 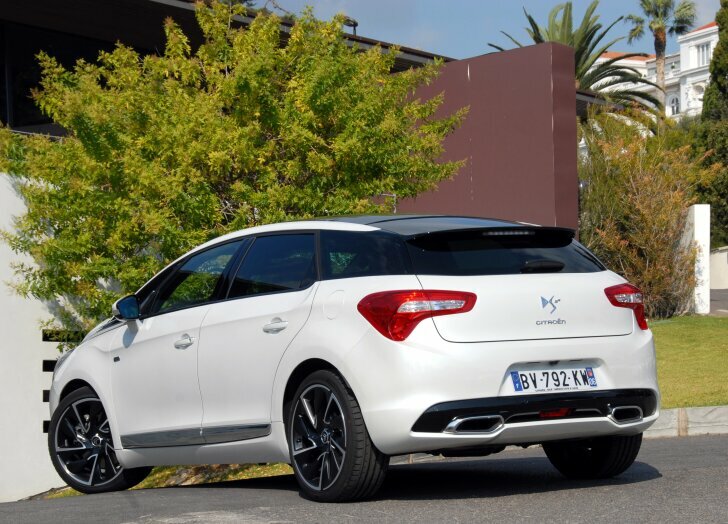 The DS5 wants to differ from the mainstream and when it comes to comfort the Citroën C5 already leaves little to be desired. This is why the DS5 doesn't offer extra comfort, it offers extra fun instead. After just one corner the DS5 already wins the heart of the driver! The feeling in the steering wheel isn't just good, even after driving for a whole day every corner is still a joy. This is also thanks to the refined underpinning and (firm) suspension. Although the DS5 certainly seems to dare the driver to corner as quickly as possible, handling doesn't surpass a BMW 3-Series or Lexus IS. On bad surfaces the DS5 can be a bit light-footed and jump over the bumps. On the motorway the DS5 is very stable. Without any corrections the DS5 follows a perfectly straight path and that benefits comfort. In city driving the DS5 proves unpractically large and visibility isn't always optimal. Because of the poor vision in the rear-view mirror, the rear-view camera is a necessity rather than a luxury. Under the skin the Citroën DS5 is a unique car as well. This goes especially for the "Hybrid4". This hybrid version differs from other hybrids. The theory remains the same: an electric motor is most efficient in the city, while an internal combustion engine is more suitable for long distances at high speeds. By combining both, the average fuel consumption is significantly decreased. Up until now, one of the main problems of developing hybrid cars was directing two power sources on one common driveshaft. Combining an electric motor and a diesel engine was especially tricky. The complex "planetary gearbox" that distributes the power of two sources to one axle would simply be destroyed by the huge torque of a diesel engine. Citroën solved this problem (together with Peugeot) simply and effectively: the diesel engine powers the front wheels, while the electric motor sends its power to the rear wheels. The only challenge left is to make both run at the same speed. It's only when accelerating full throttle that minor shocks can be felt in the driveline. 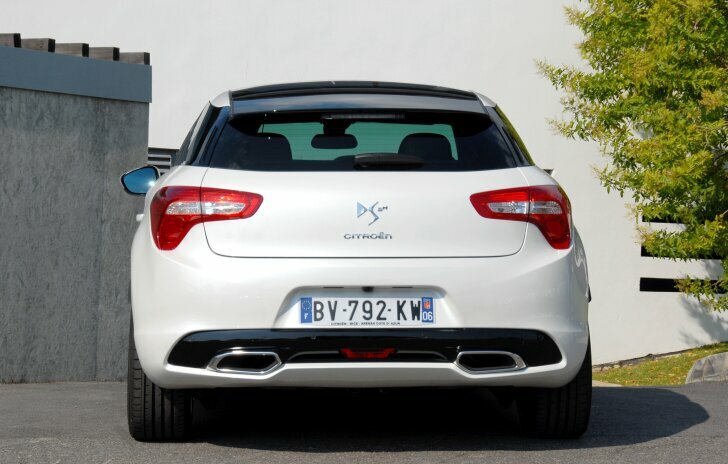 In "Sport" mode both power sources work together to increase performance, turning the DS5 into a seriously quick car. As an extra added bonus, Citroën's "Hybrid4" technology offers four-wheel drive. Although ground clearance isn't sufficient for off-road driving, crossing a patch of loose sand proved to be no problem. By engaging "Zev" mode the driver requests the system to run on the electric motor only, whenever possible. This is possible for 3 km at a maximum speed of 70 km/h. The "Hybrid4" doesn't have to be charged via mains power. Whenever the accelerator is released, the kinetic energy from the wheels is converted into electricity. While all hybrids work this way, the DS5 significantly decreases in speed while regenerating energy. While this may be unpleasant, the Citroën does gain electricity quicker than any other hybrid. In this way the electric motor can be used more often, thereby effectively improving fuel economy. Thanks to "Hybrid4" a test drive on a highly demanding track cost 5.6 litres per 100 km (50.4 mpg). 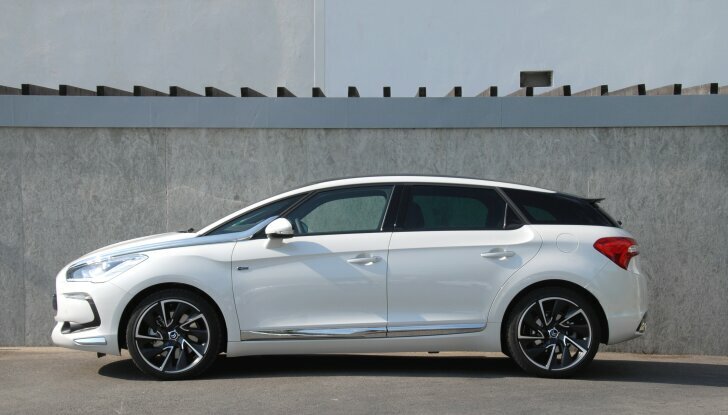 Of course the DS5 is also available with regular petrol engines and even those aren't average. The first thing one notices when driving the petrol version, is that it offers more refinement than the diesel from the "Hybrid4". The "THP 200" is quieter and runs smoother. The gear lever is nice and short, allowing for quick gear changes. 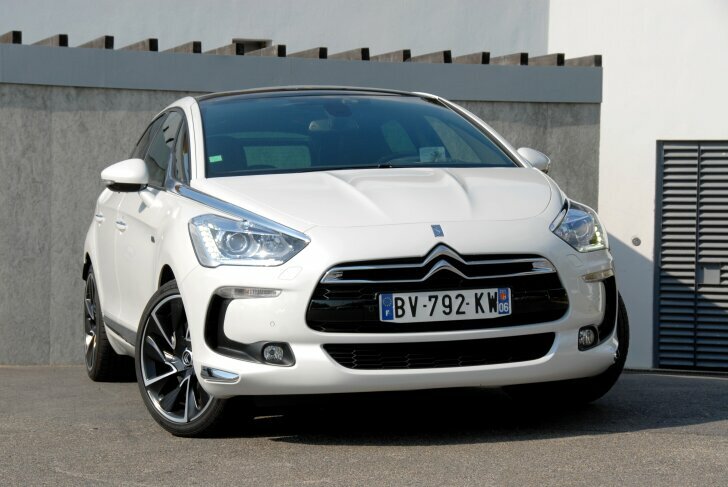 Even the fastest DS5 is fitted with a 1.6 litre engine, which has been developed in cooperation with BMW. A displacement of just 1.6 litre may seem a bit modest for a car this size, but thanks to the help of a turbocharger it develops a not so modest 200 PS / 275 Nm. This isn't merely enough power, it makes the DS5 go like a top of the range Citroën should go. Citroën wants to distinguish itself with the DS5 by combining an unusual design with high build quality, and fun to drive with low CO2 emissions. A thorough test drive proves that Citroën succeeded in this. The DS5 doesn't just differ because of its design, but also because of the art-like decoration, while quality hasn't been forgotten either. The cockpit like set-up creates a special atmosphere in the cabin, although this does go at the expense of roominess. When it comes to safety features the DS5 scores no more than average; other brands emphasise on this more. Handling is the strongest point of the DS5. Both steering and roadholding are excellent. The "Hybrid4" performs very well and offers modest off-road capabilities, while still being frugal. In the end the "THP 200" offers the most comfort and is the most fun to drive. "Three makes a beautiful number"